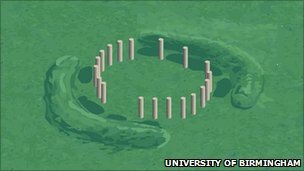 How significant is the ‘new henge’? What does the new finding reveal about the famous world heritage site? 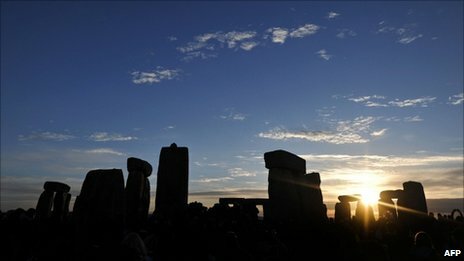 A major survey of the Stonehenge landscape started last week, and today we learn that archaeologists have found another henge. This is a three-year project, so by 2013 there could be quite a list of new discoveries. Is this real? Do we know as little about the famous world heritage site as this seems to imply? Or is it another hyped science story that will vanish with the dawn? Let’s start with the new henge. Yes, it is a significant find, and my archaeological colleagues are already e-mailing each other with tempered excitement. The first thing to ask is, is it a henge? It might well be, but without excavation we cannot know – and it all depends what you mean by “henge”. Technically, a henge is a roughly circular space enclosed by an earthwork, distinguished by a ditch lying within a bank (rather than the other way around, which would make it a fort). However, that definition actually excludes Stonehenge from the class, and the word has come to be used loosely to describe any circular ritual site in Britain dating from the late Neolithic or copper age (3,000-2,000BC). A few of these had standing stones, but more common were rings of oak posts, sometimes several inside each other on a very large scale. It is this type of site that Vince Gaffney is claiming to have found. He might well be right. The geophysics plot seems to show a circle of some 24 postholes within two arcs of 10 or so large pits. These pits might have themselves held large posts. They might indeed have held megaliths (nearby “Bluehenge”, a 10m-diameter circle of 25 stone pits, was unexpectedly discovered by excavation only last year). But they might just be very big pits: there is a henge in Dorchester, Dorset, known as Maumbury Rings, that fits that description. On the other hand, the site could be something quite different. It was previously known as a ploughed-out burial mound or barrow of probable bronze age date (2,000-1,200BC). It may still be that, but with an unusual ditch or pit arrangement around it (in which case, the large pits would be quarries for a mound in the centre rather than a bank on the outside). This is after all close to Stonehenge, and the landscape is famous for the large number and unusual qualities of these barrows. So perhaps a henge, perhaps not, but an important discovery whose significance will be fully realised only with excavation. 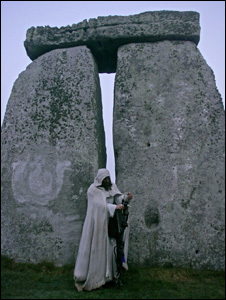 As to why archaeologists did not know about such a monument so close to Stonehenge, there are two main reasons. The landscape is extensive and fieldwork is slow and expensive. Most archaeologists are working with very small budgets – in the past, many were not paid at all. So archaeologists focused their attention where they knew there was something to be found. Until recently, there was endless excavation at Stonehenge itself, and almost none beyond. Inevitably, this had the effect of convincing some people that there was nothing else to find elsewhere. On the other hand, the science of archaeological fieldwork is advancing fast. Professor Gaffney and his colleagues from the University of Birmingham, and the Ludwig Boltzmann Institute for Archaeological Prospection and Virtual Archaeology in Vienna, are pioneering highly sophisticated survey equipment and software. It is the extremely high resolution of the survey data that has allowed this “henge” to have been found. So it is an important discovery that comes about because archaeology is learning new tricks. I am quite sure something else of at least equal interest will emerge before the three years are up. Who knows? As I am typing these words, the team is out there.